Ordinary women are performing extraordinary acts of bravery in Iran today. Neda’s image and her brutal death in Tehran this past Saturday in a street protest demanding the annulment of the results of the country’s tenth presidential election has brought the role of women in this post-election crisis to light. At the forefront of these non-violent demonstrations violently suppressed by the government-backed militias (Basij) are brave Iranian women. The story of Iranian women’s rights movements and their demands go back to the beginning of the formation of Islamic Republic of Iran in 1979. Ayatollah Khomeini called on Iranian women to rid themselves of Western influences and become ‘truly’ liberated through active participation in Islamic Republic. Iranian women’s liberation was only possible, according to Ayatollah Khomeini, if they wore the Islamic hejab, which became mandatory in 1980. As a result, the secular women were driven to the margins. By the start of the Iran-Iraq war, it was the martyrs’ wives who were the first women demanding their rights from the Islamic state that had promised them Islamic justice. These martyrs’ wives wanted the state to grant them custody of their children and not allow their husbands’ families to raise their children. The Islamic state had to flex the sharia laws (Islamic family law) in order to meet this challenge. By the end of the war, women who had taken part in the job market were no longer willing to go back to their homes. Women flooded the universities in unprecedented numbers, demanded more of their share in family matters and forcefully lobbied the authorities to grant them right to divorce in Islamic family courts that barred women to be judges. Today, 62 percent of all university students are women, rates of divorce initiated by women have accelerated and women’s rights have become an issue for the leaders of the country. Iranian women’s rights activists who have become technologically savvy launched grass-roots movements against the discriminatory laws against women in their country. The One Million Signature Campaign is one example of a social movement that started in the mayhem of the previous election. The campaigners focused on gender inequalities in the constitution and, through face-to-face interactions, successfully raised awareness among other women. The Campaign quickly spread to 16 provinces and even made the members of the conservative eighth parliament to react to their demands. But Ahmadinejad was determined to eradicate demands for gender equality under the banner of national security and alleged that women’s rights activists were motivated by the ‘enemies of the state.’ His government arrested more than 70 activists over the course of the past forty years. But as the arrests continued to rise, so did the number of volunteers in the campaign and other women’s rights initiatives. More women began to lobby for rights. They formed a broad coalition one month before the presidential election to demand all four candidates to respond to women’s issues. The coalition specifically demanded two things: the Iranian state to become a signatory in CEDAW (Convention of elimination of discrimination against women) and changes to discriminatory articles in the constitution that lead to gender inequality. The presidential candidates did respond to women’s issues. Zahra Rahnavard, Mir Hussein Mousavii’s wife, released a public statement stating that Mousavi’s cabinet will make Iran a signatory of CEDAW and will work hard to improve women’s rights. Jamileh Kadivar, the spokeswoman for Karoubi even went further to question the much taboo issue of mandatory hejab. Whereas Ahamdinejad’s government had gone to extreme measures to suppress women’s rights activists as agents of the West, the presidential debates raised women’s expectations. Ahmadinejad had proposed to make polygamy legal in the country where it is socially unacceptable and to lower the number of female attendees in universities through a gender quota system. The national TV which works under direct control of the supreme leader which has shown his support for Ahmadinejad before and after the disputed election, made one program after another advocating the women’s ‘proper place’ in an Islamic society. So, it is not surprising to see waves of women in chadors or rusari (headscarf) to come to street to protest a fraudulent election, a coup indeed to re-elect Ahmadinejad. Iranian women know that there is much at stake for them. Four more years of Ahmadinejad will bring more morality police into the streets that harass women and more pressure on Iranian women’s rights activists. Today, Iranian women are in the streets protesting and throwing themselves at the Basij to protect the lives of the youth, the students and all those who want their voices be heard through a non-violent movement. The middle-aged women remind the Basij of the Islamic Republic’s promise to women; Islamic justice that would be better than any Western ideas including feminism. The bloody face of Neda will export the revolutionary promises but in a completely opposite way than what was initially intended by the founders of the Islamic state. UPDATE: A group of mothers gathered in a park in Tehran on Saturday (June 27th) to commemorate Neda and all those who have been martyred by the basij and security forces since June 12th in various peaceful protests in Tehran and other cities. They started pouring into Park Laleh in the center of Tehrann around 5 p.m. Their numbers grew by the minute. The security forces attacked their peaceful demonstration and brutally beat them with buttons. The security forces and the plain-clothed men believed to be Basijis detained around 20 protesters. They have been transferred to a female-only detention center on Vahdat Eslami street (literally means Islamic Union street). Editor’s Note: Elham Gheytanchi teaches sociology at Santa Monica College. She writes about women, culture and politics in Iran. I think the West will never look the same way again towards Iran. Now we will have to differentiate between the regime and the people of Iran in our foreign policy. Neda changed the stereotype way the West look to women in the Middle East societies. She is the new face of women not only in Iran, but also in the Middle East. We are not mourning her, but celebrating her. Neda couldn’t stand the injustice; she simply wished to see her vote counted. Regardless to the outcomes or the results of the current situation, Iranians already “Won”. They won the attention, the sympathy, and the respect of the entire World. 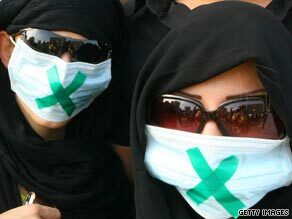 Young Iranian women have shown themselves to be very strong and instrumental in this uprising. You have to give credit to their mothers who were raised in an open society during the Shah's regime and thus accustomed to having rights. So they instilled those ideas in their daughters minds. Iranian women are different than Arabs because prior to the Islamic Republic, Iranian women were free from the restrictions and limitations of today and had voting rights, right to drive, right to education, etc... and were in parliment, the army and served as ministers. Iranian women of today want what rightfully belongs to them and what their mothers had – freedom and equality. Everyone who fights and is willing to die for their freedom is extraordinary. We all are in support of these brave women and their countrymen. Iran, which seemed very closed and homogeneous, has changed much socially in these years. Women are the forces of social change. They have studied and passed the men in educational indicators. The framework for renewal and increase of educational level of women now confronts against the authoritarianism of the political-religious. Women are made of sterner stuff. Iranian women , who braved all opposition ,few decades back, will resolutely face the grim situation and will emerge successful much to the chagrin of the elected representatives. I'm fed up with all the false information put out above Canada's Health Care Plan. In 1971, when the Plan was approved, our health costs were roughly equal to yours. Now our costs are 1/4 of yours. Moreover, we can see any GP we want anywhere in Canada. Yes, you must see a GP to see a specialist if you need to but again any one you want. Yes, there are waiting lists but these are triaged and you can get immediate treatment by a GP and a specialist, if necessary, by going to the ER of any hospital you choose. We have no punitive damages in the event of litigation...as a result, malpractice insurance costs are minimal. All of our medical treatment is FREE and EVERYONE is covered. No one goes bankrupt because of Health Care costs. Our brand name drugs are much cheaper than yours and, as opposed to what your politicians say, they come from the very same pharmaceutical companies as yours. Research has indicated that most Canadians believe that we have the best health care plan in the world. 46 million Americans have no coverage and hospitals typically charge them 2-4 times what is paid for Americans who have insurance. Malpractice premiums are obscene both for doctors and hospitals. Even Americans who are insured very often end up paying thousands of dollars themselves. 50% of your bankruptcies are due to health care costs. Your insurance companies typically force their insureds to use generic drugs until it's proven beyond a doubt that brand name drugs would be more effective. It is also much more cost effective to have GP's treat cases whenever they can instead of patients' automatically going to specialists, even though their illness does not require them to do so. WHICH SYSTEM WOULD YOU PREFER??? It's not just Iranian Women. It's Women who are extraordinary. look the usa does not need to get involed with iran who cares what they do what we need to be worried about is north korea that kim jong ill is a crazy idiot. and now he has nukes and i bet he will use them. thats what we need to focus on mr president if they want to threaten us with nukes break ares out i mean what other option do we have. this is why i dont vote for democrats for president historicly they are weak on defence the whole world knows it and thats why they all waited for pres. bush to leave office because they knew what would have happend to them. i mean obama gets in there and tell n korea not to test fire missles or there will be consiquenses. and what do they do launch em. what did obama do run to the un typical demicrat. i no were streched in 2 wars but i mean what do we need to worry about if they hit wth a nike we will be dead. come on mr president get with the game here get on the phone with bush and get some pointers. i no you were never in the military and u dont have clue of what to do ask my hero president george w bush he will tell you. There is an angle that keeps missing in the covering of the Iranian situation: the reactions from other Muslim countries, what they're saying officially and unofficially. This will decide the development much more than how the US and the EU handles the situation. Exploring this angle will establish 360 as the frontrunner experts on this topic, so go for it. I hope that Neda's death was not in vain and that the women of Iran can use it to go on the attack for more rights for themselves. It is ridiculous how they are treated as second class citizens. No one is anyone elses property to do with as they please.